To donate please click here and enter our safe donation page. 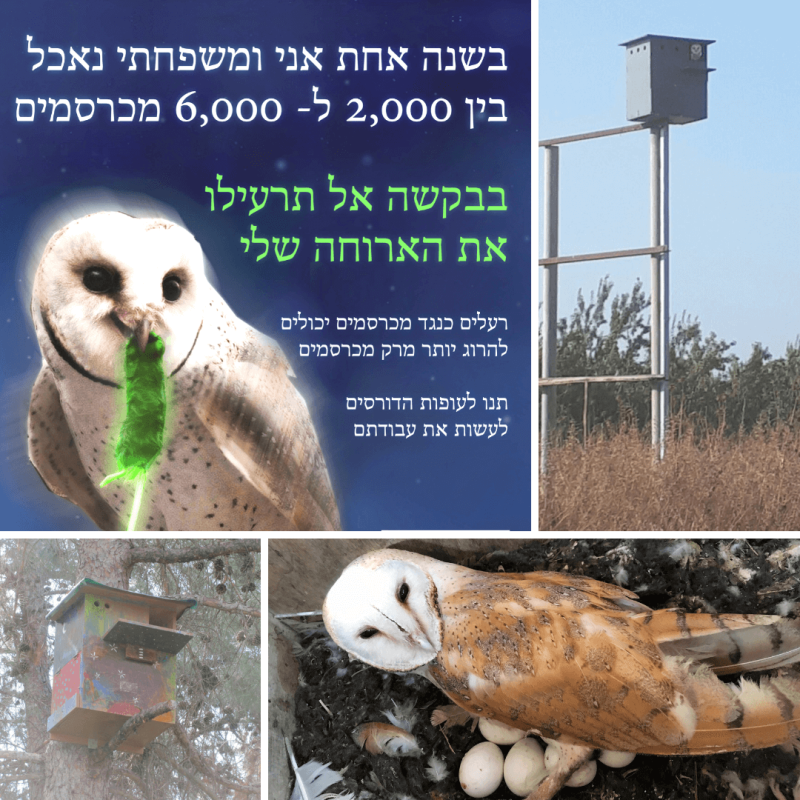 The Charter Group of Wildlife Ecology leads an outreach project called Project Bird Box Israel where we assist to purchase nest boxes for farmers and schools/ kindergartens and provide assistance for the Israeli farmers. You can specify if you want your generous gift to go the barn owl nest box project or education. Donation to barn owl project: In recent decades, there has been a general trend towards phasing out agriculture and replacing it with other kinds of enterprise, which is a sad end to the Zionist dream of cultivating the land of “milk and honey. The project is geared towards assisting and advising farmers and monitoring the nest boxes, but, to a much lesser extent, covering expenses for materials (nest boxes, etc). Here we are trying to assist Israeli farmers to use barn owl as biological pest control agents of rodents and thereby reducing the use of harmful pesticide use in agriculture. The idea behind Project Bird Box Israel is to assist farmers by providing information that we learn from our scientific and also to assist with farmers in purchasing the nest boxes. We do not pay 100% of the funds required for all the nest boxes, but rather to participate in the cost of providing them to farmers. For example, they will buy 4 new boxes and will will add the 5 box. Your donation will provide funds for either purchasing a new nest boxes or repairing and painting old ones. Donation to education: No kindergarten/school should be deprived of the marvels of watching a family of birds in action. Yet due to financial difficulties many schools in Israel (especially in the periphery), cannot afford to buy a nest box on their own. Your donation will go towards providing a nest box for a kindergarten. It will come with all the necessary information about the birds that will occupy it and instructions about how to use the next box. Please write in the detail section of the donation form whether you want to donate to the barn owl or education projects. All amounts will be greatly appreciated. All donations to Project Bird Box Israel are made to the University of Haifa in Israel.